This website has affiliate links which will redirect you to the official Grammarly website. If you will sign up using our link, then we will get a commission from them. All content provided on this blog is for informational purposes only. As the owner of this blog, I make no representations as to the accuracy or completeness of any information on this site. As the owner of this blog, I make no representations as to the accuracy or completeness of any information on this site. The owner will not be held responsible for any errors or omissions in the information provided on the blog, nor for the availability of this information. Also, the blog owner will not be held responsible for any losses, injuries, or damages from the display or use of this information. All opinions expressed on this blog and also in the guest posts are solely those of its authors and do not give the opinions of any organizations or any affiliates or grammarchecker.online. 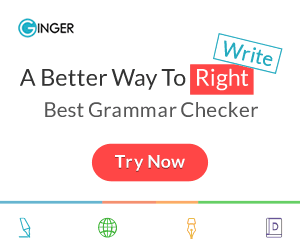 We also use third party advertisements on grammarchecker.online to support our site. Some of these advertisers may use technology such as cookies and web beacons when they advertise on our site, which will also send these advertisers (such as Google through the Google Adsense program) information including your IP address, your ISP, the browser you used to visit our site. This is generally used for geotargeting purposes or showing certain ads based on specific sites visited.